Experience Southern Africa's abundant natural treasures in unparalleled comfort and luxury on an A&K Botswana safari. From the floodplains of the Okavango Delta to the woodlands of Chobe National Park, Botswana's diverse habitats provide the perfect settings for extraordinary safari excursions. On the Botswana safari, encounter the abundant wildlife of the Okavango Delta, the biggest inland delta in the world. Here, the drama of life unfolds at every turn, whether during frequent game drives aboard safari vehicles designed to offer exceptional views or during water safaris by mokoros (dugout canoes) through flooded plains. The Mombo Concession in the Moremi Game Reserve is considered the country's "predator capital," and the A&K Botswana safari reveals leopard, cheetah, prides of lion and the endangered African wild dog hunting for prey. Botswana is also home to Africa's largest elephant population, and on the Botswana safari, you walk with semi-habituated elephants and learn about these complex animals from life-long experts. Many A&K Botswana safaris also include opportunities to travel to the mighty Victoria Falls, a must-see spectacle. In the evening, retire to the region's most elegant and intimate lodges and camps. Some lodges feature star beds for a night under the shimmering African skies - the perfect way to contemplate nature's breathtaking beauty and the day's discoveries on the Botswana safari. A first-time safari-goer visits the Okavango Delta in Botswana, and over the course of one adventure-packed day, encounters more than she ever imagined. 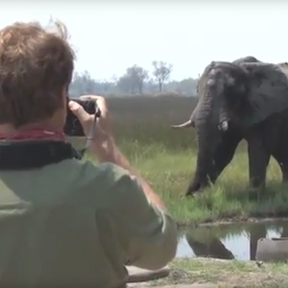 Born to Explore host Richard Wiese visits Sanctuary Stanley's Camp, Botswana and the inspiring Living with Elephants project in this exclusive video. Which A&K Safari is Right for You?